WASHINGTON (CNN) -- More work is needed on proposed health care legislation to make sure that it doesn't add to the budget deficit, Health and Human Services Secretary Kathleen Sebelius said Sunday. 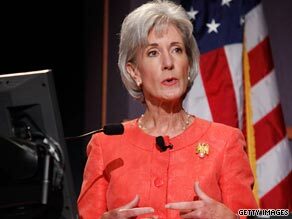 Health Secretary Kathleeen Sebelius said it may be necessary to tax the wealthy to pay for health care reform. Appearing on the NBC program "Meet the Press," Sebelius said a tax surcharge on wealthy Americans is "a legitimate way to go forward." The taxes would start with people making $350,000. She noted the tax surcharge provision in a House proposal was one of several options under discussion to help pay for overhauling the nation's ailing health system. A final bill "will be paid for -- it will not add to the deficit," Sebelius said of health care reform, which is President Barack Obama's top domestic priority. Both the House and Senate are working on proposals that would create a government-funded public health insurance option intended to drive down costs of private coverage. However, the nonpartisan Congressional Budget Office reported last week that the measures currently under consideration in both chambers would not pay for themselves, increasing the budget deficit. Democrats pushing the health care bills argue the CBO analysis lacks the impact of cost-cutting measures under discussion for existing programs such as Medicare and Medicaid. Sebelius said that all proposals include provisions to decrease fraud and improve efficiency of the current system. Republican opponents so far say the government is over-reaching by seeking to reform the whole system, which is draining the federal budget while leaving 46 million Americans uninsured. Also appearing on "Meet the Press," Senate Minority Leader Mitch McConnell of Kentucky called for expanding the tax deduction on health care costs for employers to include individual taxpayers -- what the Republicans call equalized tax treatment -- and limiting medical malpractice lawsuits that he said drive up the cost of medical care. "I'm not in favor of doing nothing," McConnell said. "It's important to reduce the number of uninsured. The question is how to do that." Both the House and Senate proposals so far include mechanisms to raise revenue through increased or new taxes. The Senate Finance Committee wants to create a new tax on medical benefits provided by employers, a plan that Obama opposes. Sebelius said the new tax could cause employers who provide coverage for 180 million Americans to change or drop their programs, which could "dismantle the private market." "He's reluctant to move in that direction," she said. Obama continues to favor reducing the limit on income tax exemptions for high-income Americans, Sebelius said.